I’m all about Essential Oils. I grew up with my mom using essential oils, specifically Tea Tree oil, to help cuts and whatnot heal. I actually use my Lavender and Peppermint oils as perfumes! Essential Oils are basically a concentrated oil that comes from different plants…there’s a lot more to it than that, so if you want, check out how Young Living does it! So what do you do with Essential Oils? How do you use them? Well, the fun thing is, you can basically use Essential Oils on/with everything. Cooking, wellness, cleaning, and even to get rid of pimples! There are a ton of ways to put them to good use…but I’m going to share with you some of my favorite Essential Oils that I always have and what I do with them! Lavender has always been associated with a calming effect, and it truly does work! If I know I have a long or stressful day ahead of me, I’ll put my little Lavender oil in my purse and simply smell it when I’m starting to feel overwhelmed. It helps me come back to my center and focus. You can even infuse salts with the oil for a calming bath or blend together some lavender and water in a spray bottle and spray your bed before you go to sleep to ensure a restful night! Lavender is also wonderful for getting rid of headaches! Peppermint is known as the “cooling” oil. Which makes sense! When you have peppermint gum, you get a cool rush! Peppermint oil is a great alternative to Vick’s Vapor Rub or those little Vapo Inhaler’s. When you think about it, those things are essentially just peppermint in different forms! So I use the actual concentrated, natural oil instead of buying the other stuff. You can mix coconut oil and Peppermint oil (maybe even add in some Eucalyptus oil) to make your own homemade, natural vapor rub! Peppermint is also great for fevers and digestive issues! Eucalyptus is one of those oils that can basically do everything! It’s awesome for jet lag…you can make a little spray for after your flight to spray on your face and wake you up! It’s also good for coughs, congestion, a natural cleaner for around the house, and even to care for your wounds / cuts! Tea Tree is one of the best things to keep in your house. I grew up with my mom using it for all sorts of things, but mostly cuts and insect bites! So if you’re going camping, bring your Tea Tree oil with you! It’s also amazing for acne and getting rid of pesky pimples! Bye bye unwanted pimples! 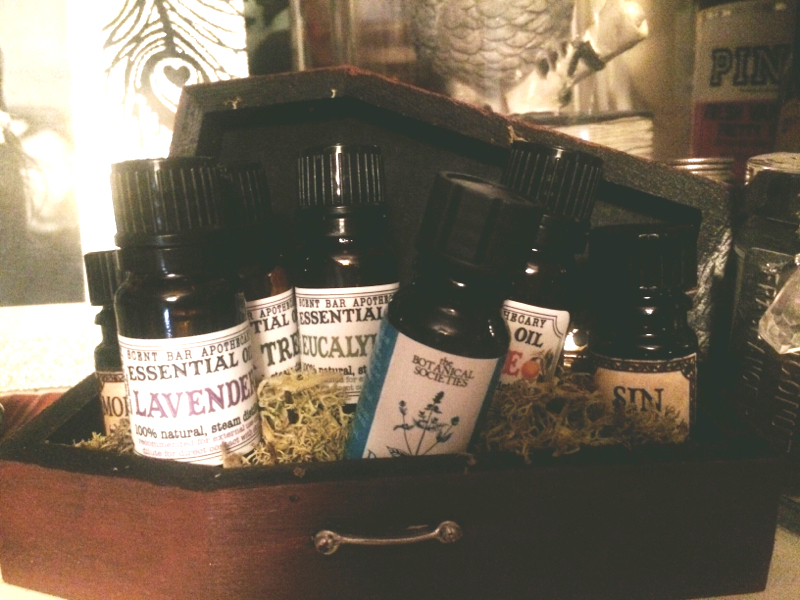 There are many different Essential Oils to check out but these four are my favorite. Don’t get me wrong, I also have: Orange, Lemon, Frankincense, Lemongrass, Clary Sage, and Oregano! I love using these oils in my daily life. They’re a wonderful alternative for people who like to use natural remedies, rather than all those crazy packages and tubes at the store that are filled with poisons. Yeah, I’m a hippie. Proud of it. Leave a comment below and tell me: Have you used Essential Oils before and which one is your favorite?! And don’t forget to subscribe! PS- Little hacking tip: Essential Oils can be expensive…but I always get mine at places like Nordstrom Rack, or TJ Maxx!! You can get them there of much cheaper and usually in little packs of 3!